German tech up for grabs! 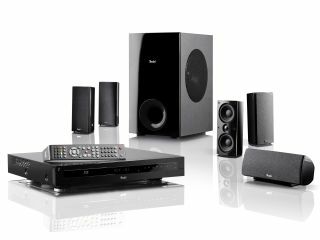 TechRadar is teaming up with home cinema experts Teufel, Europe's leading direct seller of audio equipment and loudspeakers, to give one lucky reader the chance to win the Impaq 3000 Blu-ray surround sound system worth £619. The Impaq 3000 is the perfect solution for setting up your first 5.1 home cinema system. The centrepiece of the system is the IP 3000 Blu-ray receiver, which as well as delivering great quality images also pumps out a potentially ASBO warranting 600 watts of power. Teufel have over 30 years experience as a loudspeaker manufacturer and this is where the system really comes into its own. Each of the five satellite speakers houses two 80mm midrange drivers and one 19mm tweeter and are capable of producing rich detailed sound afforded by the Blu-ray format's uncompressed audio. The satellite's are complemented with plenty of low end rumble provided by the the system's sub-woofer which can comfortably handle frequencies as low as 38Hz. Teufel was founded in 1979 and is one of the most well respected loudspeaker manufacturers in Europe. All Teufel speakers are precision engineered in-house at their Berlin headquarters. Teufel loudspeakers come with an unparalleled 12 year guarantee and, as a direct seller, any Teufel system can be tried out at home for up to 8 weeks – if it's not right for you, simply return for a full refund. This competition is now closed. The winner is Mr S Shinh.